Get the best conservative writing, reporting, and analysis available anywhere. The classic National Review magazine, which has defined the modern conservative movement since 1955. Get the best conservative writing, reporting, and analysis available anywhere – delivered right to your door. Each issue typically includes Letters to the Editor, The Week, Articles, Features, The Long View, Athwart, Happy Warrior, and Books, Arts & Manners. Receive exclusive offers, just for print subscribers, including early notice and pricing for NR cruises and other special events. All-access digital membership: Everything you would associate with a digital magazine subscription, and a whole lot more. *Auto-renews at intro annual rate of $69. How do I manage my National Review subscription(s)? Manage your print or NRPLUS (digital) subscriptions on our Customer Care site. After logging in, you can update your mailing address, payment information, and more. 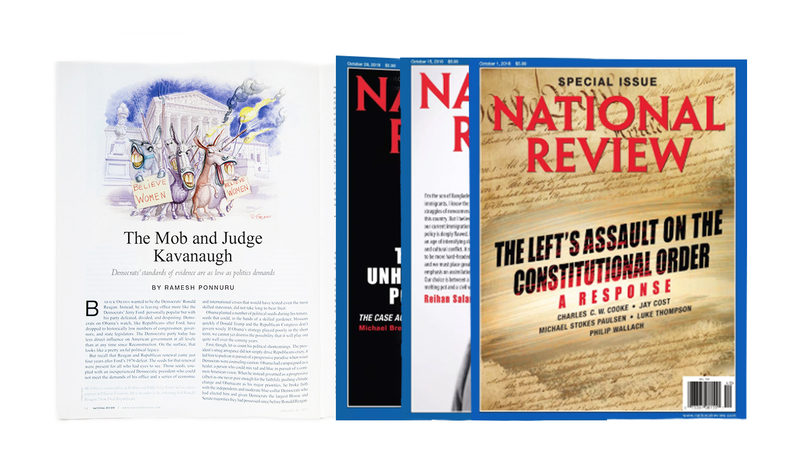 If you purchased a subscription to National Review magazine content on iTunes, Google Play, Barnes & Noble (Nook), Amazon (Kindle Fire), Texture, Blendle, and/or Readly. You will need to access these platforms to manage your account and purchases. Yes. After logging in to our Customer Care site, you may: Report missing or damaged issues; change your delivery address; renew your subscription; cancel your subscription; suspend your subscription; ask credit-card questions; update your mailing or payment information; reset your password, and much more. 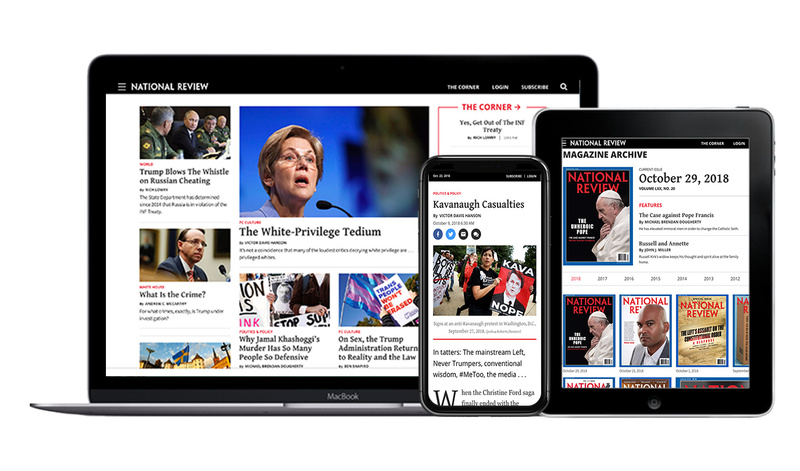 When you link your subscription, you connect your subscription account details with a www.nationalreview.com login. 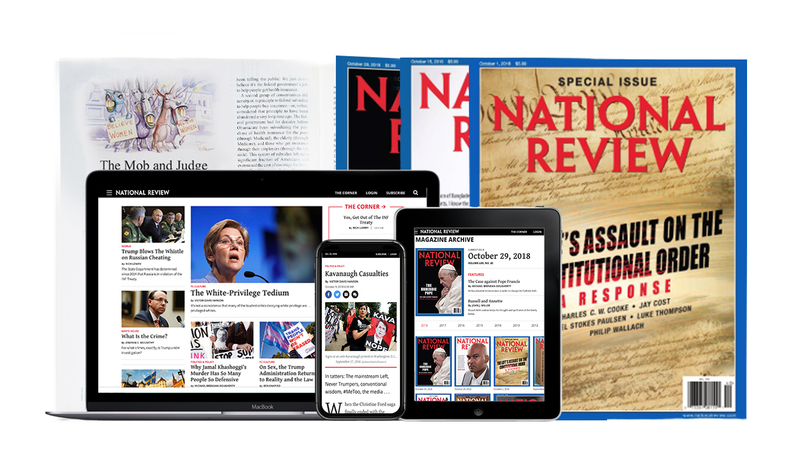 Once you’ve linked and signed in – and if you are an active NRPLUS member – you get unlimited access to the National Review website, including all magazine and premium content. I am a subscriber to the National Review digital magazine but I am not an NRPLUS member. What’s the difference? To make changes to your e-mail address or password, login to Customer Care and click either the “Add/change my e-mail” or “Change Password” link in the left-hand navigation. If you forgot your password, go to our our Customer Care site. Click “Forgot your password?” in the “Login Using Your Email and Password” section and follow the instructions from there. Is premium access to www.nationalreview.com included with my print subscription? No. But existing print subscribers can e-mail customer service here to inquire about “bundling” their subscription with an NRPLUS membership. If I am a subscriber to the digital magazine and want to add premium website (NRPLUS) access, what do I do? If I am a digital magazine subscriber or NRPLUS member, do I need to pay the full price for a subscription to the print magazine? Existing digital subscribers or NRPLUS members can add a print magazine subscription for a special reduced price. E-mail customer service here to inquire about this opportunity. If I cancel my print subscription, when does the cancellation go into effect? The cancellation will go into effect immediately, although you may receive an additional issue in the mail since we date our magazines in the future. If I cancel my subscription, print or NRPLUS (digital), do I get a refund? Yes. You will receive a prorated refund based on the number of unserved issues on your existing subscription. Can I cancel my print subscription and continue with digital only (NRPLUS)? Yes. E-mail customer service here to inquire about your options. When do you charge me for my subscription purchase? Credit cards are charged upon receipt of orders. The charge may take several days to appear on your credit-card statement. This page describes the terms and conditions that govern your use of certain National Review digital products, including NationalReview.com and mobile applications, offered by National Review, Inc.
1.1 If you choose to use NationalReview.com, National Review’s mobile sites and applications, any of the features of this Site, including but not limited to RSS, API, software and other downloads (collectively, the “Services”), you will be agreeing to abide by all of the terms and conditions of these Terms of Service between you and National Review, Inc.
1.3 IF ANY OF THESE RULES OR ANY FUTURE CHANGES ARE UNACCEPTABLE TO YOU, YOU MAY CANCEL YOUR MEMBERSHIP BY CONTACTING CUSTOMER CARE AT (800) 464-5526. 2.1 The contents of the Services, including the Site, are intended for your personal, noncommercial use. All materials published on the Services (including, but not limited to news articles, photographs, images, illustrations, audio clips and video clips, also known as the “Content”) are protected by copyright, and owned or controlled by National Review, Inc. or the party credited as the provider of the Content. You shall abide by all additional copyright notices, information, or restrictions contained in any Content accessed through the Service. 2.3 You may download or copy the Content and other downloadable items displayed on the Services for personal use only, provided that you maintain all copyright and other notices contained therein. Copying or storing of any Content for other than personal use is expressly prohibited without prior written permission from National Review, Inc., or the copyright holder identified in the copyright notice contained in the Content. 2.4 The Content of the Services is owned or licensed to National Review. Certain Content is furnished by the Associated Press and Reuters, or other Third Party Partners which will not be liable for any delays, inaccuracies, errors or omissions in any such Content, or in the transmission or delivery of all or any part thereof, or for any damages arising therefrom. Debate, but don’t attack. In a community full of opinions and preferences, people always disagree. National Review encourages active discussions and welcomes heated debate on the Services, but personal attacks are a direct violation of these Terms of Service and are grounds for immediate and permanent suspension of access to all or part of the Service. 3.2 The Services shall be used only in a noncommercial manner. You shall not, without the express approval of National Review, Inc., distribute or otherwise publish any material containing any solicitation of funds, advertising or solicitation for goods or services. 3.3 You acknowledge that any submissions you make to the Services (i.e., user-generated content including but not limited to: comments, forum messages, reviews, text, video, audio and photographs, as well as computer code and applications) (each, a “Submission”) may be edited, removed, modified, published, transmitted, and displayed by National Review, Inc. and you waive any rights you may have in having the material altered or changed in a manner not agreeable to you. Submissions made to the Services may also be included in our RSS feeds, APIs and made available for republishing through other formats. 3.4 You grant National Review a perpetual, nonexclusive, world-wide, royalty free, sub-licensable license to the Submissions, which includes without limitation the right for National Review or any third party it designates, to use, copy, transmit, excerpt, publish, distribute, publicly display, publicly perform, create derivative works of, host, index, cache, tag, encode, modify and adapt (including without limitation the right to adapt to streaming, downloading, broadcast, mobile, digital, thumbnail, scanning or other technologies) in any form or media now known or hereinafter developed, any Submission posted by you on or to the Services or any other website owned by National Review, including any Submission posted on or to the Services through a third party. 3.5 You are solely responsible for the content of your Submissions. However, while National Review does not and cannot review every Submission and is not responsible for the content of these messages, National Review reserves the right to delete, move, or edit Submissions that it, in its sole discretion, deems abusive, defamatory, obscene, in violation of copyright or trademark laws, or otherwise unacceptable. 5.1 You represent, warrant and covenant (a) that no materials of any kind submitted through your account will (i) violate, plagiarize, or infringe upon the rights of any third party, including copyright, trademark, privacy or other personal or proprietary rights; or (ii) contain libelous or otherwise unlawful material; and (b) that you are at least thirteen years old. You hereby indemnify, defend and hold harmless National Review and all officers, directors, owners, agents, information providers, affiliates, licensors and licensees (collectively, the “Indemnified Parties”) from and against any and all liability and costs, including, without limitation, reasonable attorneys’ fees, incurred by the Indemnified Parties in connection with any claim arising out of any breach by you or any user of your account of these Terms of Service or the foregoing representations, warranties and covenants. You shall cooperate as fully as reasonably required in the defense of any such claim. National Review, Inc. reserves the right, at its own expense, to assume the exclusive defense and control of any matter subject to indemnification by you. 5.2 National Review does not represent or endorse the accuracy or reliability of any advice, opinion, statement, or other information displayed, uploaded, or distributed through the Services by any user, information provider or any other person or entity. You acknowledge that any reliance upon any such opinion, advice, statement, memorandum, or information shall be at your sole risk. THE SERVICES AND ALL DOWNLOADABLE SOFTWARE ARE DISTRIBUTED ON AN “AS IS” BASIS WITHOUT WARRANTIES OF ANY KIND, EITHER EXPRESS OR IMPLIED, INCLUDING, WITHOUT LIMITATION, WARRANTIES OF TITLE OR IMPLIED WARRANTIES OF MERCHANTABILITY OR FITNESS FOR A PARTICULAR PURPOSE. YOU HEREBY ACKNOWLEDGE THAT USE OF THE SERVICES IS AT YOUR SOLE RISK. Each registration is for a single user only. You are not allowed to share your registration login credentials or give your login credentials to anyone else. We may cancel or suspend your access to the National Review Services if you share your login credentials. You are responsible for maintaining the confidentiality of your password, which you will not have to reveal to any representative or agent of National Review. You may not (i) select or use the login credentials of another person with the intent to impersonate that person; (ii) use login credentials in which another person has rights without such person’s authorization; or (iii) use login credentials that we, in our sole discretion, deem offensive. Failure to comply with the foregoing shall constitute a breach of these Terms of Service, which may result in immediate suspense or termination of your account. 6.2 Please notify Customer Care of any known or suspected unauthorized use(s) of your account, or any known or suspected breach of security, including loss, theft, or unauthorized disclosure of your password or credit card information. 6.4 You are responsible for all usage or activity on your NationalReview.com account, including use of the account by any third party authorized by you to use your login credentials. Any fraudulent, abusive, or otherwise illegal activity may be grounds for termination of your account, at our sole discretion, and we may refer you to appropriate law enforcement agencies. 8.2 National Review reserves the right to send electronic mail to you for the purpose of informing you of changes or additions to the Service. 8.4 National Review may contact you via email regarding your participation in user surveys, asking for feedback on current Services or prospective products and services. This information will be used to improve the Services and better understand our users, and any information we obtain in such surveys will not be shared with third parties, except in aggregate form. 9.1 You shall have no rights to the proprietary software and related documentation, or any enhancements or modifications thereto, provided to you in order to access the Services (“Software”). You may not sublicense, assign or transfer any licenses granted by NationalReview.com, and any attempt at such sublicense, assignment or transfer shall be null and void. You may make one copy of such software for archival purposes only. You may not otherwise copy, distribute, modify, reverse engineer, or create derivative works from Software. 10.1 You may terminate your account at any time by calling Customer Care at (800) 464-5526. Upon termination, you will receive an automated confirmation via email that the cancellation was processed, and your access will be suspended within 24 hours. 10.2 National Review may, in its sole discretion, terminate or suspend your access to all or part of the Services for any reason, including, without limitation, breach or assignment of these Terms of Service.